WordDump is an application for extracting all the words from documents, or text selections, and presenting them as a list, optionally accompanied by their frequency in the document. 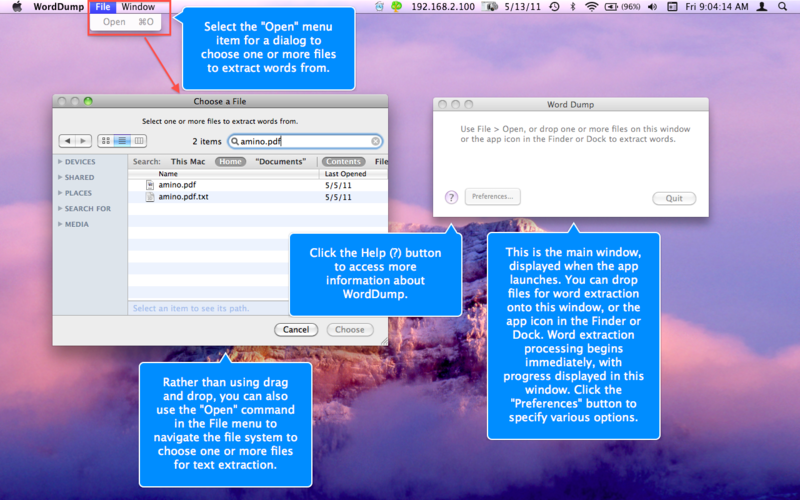 Better yet, the WordDump app also provides this function conveniently as a Service, in any app Services menu or its contextual menus, along with other other auxiliary service functions explained below. As a service you can apply the functionality to text selections in an app that support services, such as Safari or TextEdit. The extracted word list can be ordered alphabetically or by their frequency in the document. Supported document formats include Text, PDF, HTML, RTF, and RTFD, but any document that can be indexed by Spotlight is supported by WordDump. Once the application is installed, and run once, the Keyboard System Preference pane can be used to access Services Preferences. The WordDump menu items in Services Preferences are: Count Characters, Count Words, Dump Words and Spell Out Number. Click down in the region to the right of these items in Services Preferences to associate keyboard shortcuts with them, and use the checkboxes to their left to include or exclude them from the Services menus. • The WordDump service, available from an app's Services menu, or its contextual menu, if it supports that, also counts the characters and words in files and text selections. These menu items are called "Count Characters" and "Count Words." You may need to turn on the option to display the service menu items in the Services Preferences of System Preferences.